On 28th July 1891 the master builder was supervising the erection of an extension to Walkerburn kirk when he remembered about an appointment in Innerleithen. He hurried to Walkerburn station to catch the 2.16pm train from Galashiels but, as he was crossing the track to reach the platform, he was struck by the approaching locomotive and fatally injured. This was the sudden and tragic end to the life of 59 year old Robert Mathison, mason, builder, antiquarian and polymath. A few days after the accident he was buried in St. Andrews churchyard in his native Peebles with the town bell tolling during the slow procession of the funeral cortege. 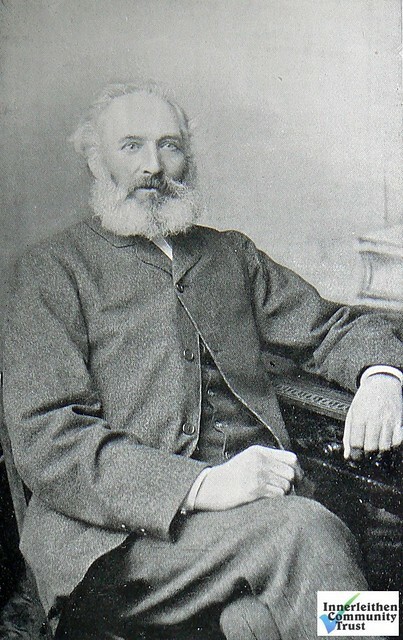 Robert Mathison was born in the Northgate in 1832 and some ten years later the family moved to Traquair where for the following thirty years his father was a forester on the estate. Robert was apprenticed to the builder Robert Hall of Galashiels and for a while worked in various locations throughout the Borders. While employed with Hall in the 1850s he worked on the building of the first stage of the Glen mansion house designed by David Bryce. He returned to Traquair in the 1860s and, following a brief partnership with a Charles Nicol, he set up business on his own before finally settling in Innerleithen in 1871. Not only was Robert Mathison a fine builder and stone mason he was also an erudite and learned man, entirely self-taught. From his boyhood in Traquair he roamed the Border hillsides collecting ferns, mosses, plants and a wide range of native flora, gaining extensive knowledge of botany in the process. Local folklore, history and archaeology greatly interested him and he travelled widely in order to visit every fort, castle, keep, tumulus, standing stone and battlefield in the Borders. He knew the background to all the sites he visited and could recite associated ballads and poetry at length. He collected artefacts and fossils and was also a keen astronomer, being credited with the sighting of a comet missed by the Scottish National Observatory. In 1888, he was a founder member and first president of the Innerleithen Alpine Club. This was an association of men and women who made trips to locations in the Borders of geological, archaeological, historical and botanical interest under the leadership of an invited expert. Despite being a prominent citizen and employer in Innerleithen for twenty years there is no memorial to Robert Mathison in the town. Perhaps this has not been felt necessary because of the many fine buildings that remain monuments to his skill and are his legacy to local architecture. As well as building the original “Beechwood” in Peebles Road for James Ballantyne (this building was later enlarged and now comprises “Rhuallan” and “Moorside”) and “Runic Cross” in Waverley Road for himself, he was contracted by John Miller to extend Leithen Lodge. He also built the mansion house at Orchard Mains (now completely vanished) for Lord Cecil and “Stoneyhill” for John Ballantyne in Walkerburn. The architect for the latter project was the “eccentric” F.T. Pilkington who also designed the (later altered) Parish Church in Leithen Road. The exteriors of three of the four churches said to have been built by Mathison survive with little outward change to this day. The missing one was the former St. John’s Free Church in Horsbrugh Terrace, which was demolished some time ago and the stone and slate usefully recycled in the construction of a cottage in nearby Horsbrugh Street. A contemporary map on Innerleithen shows this church was already in place in the late 1840s soon after the Disruption of 1843, at which time Robert Mathison was still in his teens and employed by Robert Hall. Both John A. Anderson and the author of the obituary in the “Peeblesshire Advertiser” cite Mathison as the builder, but it may be that he was involved in refurbishment or modernisation at a later date. The only Mathison-built church still used for its original purpose is St. James’ Roman Catholic Church at the west end of the High Street, funded by a bequest from the Stuart family of Traquair and erected between 1879 and 1881. Designed by John Biggar of Edinburgh, the style is described as “English decorated Gothic” and is of “snecked rubble” construction with sandstone dressings. It boasts the only spire in town. Another fine example of the master builder’s work can be seen nearby at “Alpine Bikes” in Peebles Road. This was the “new” Congregational Chapel built in 1889 to a design by Frank W. Simon and constructed of whinstone and Locharbriggs red sandstone. Strangely, Mathison is probably best remembered today neither for his erudition nor his building prowess but for the outcome of a demolition job! In the early 1870s he was contracted take down the former Parish Church in the Kirklands graveyard. As the material was to be used to build a house (“Beechwood” mentioned above) the work proceeded with care and Mathison noticed something unusual about one of the stone blocks being salvaged. With his antiquarian knowledge he was able to identify the strange markings carved on the stone as very ancient and Celtic in origin. The stone was part of the shaft of a Christian cross and of considerable archaeological value. Interest in the discovery was widespread and the Society of Scottish Antiquarians attempted to have it placed in the national museum in Edinburgh. Under the terms of his contract, however, Mathison was entitled to retain all the materials of the old church and so the precious artefact remained in Innerleithen. The “Runic Cross” as we now know it sits on a pedestal provided by the Masons of Lodge St. Ronan’s No. 856 in front of the present Parish Church. The best and easiest way to gain an understanding of the importance of this relic and its context within the town’s traditions is to attend the Masonic part of the Cleikum Ceremonies held outside the church and listen to the address by the Right Worshipful Master, part of which is printed below. John A. Anderson, who attended many of the Alpine Club outings as a boy, described Robert Mathison in his late fifties as “tall, spare and lithe”. A bachelor all his days, Robert Mathison had a brother and four sisters, two of whom kept house for him at “Runic Cross”. He should not be confused with Robert Mathieson the chemist, who was Provost of Innerleithen for forty years and for whom “Mathieson Street” is named.